This is an interesting group Photograph. This was taken on the occasion of the handing over of Hugh Millers Cottage to the National Trust. This happened in the afternoon yet in the morning, another event also took place. Taken outside East Church, at unveiling of plaque to Sir Thomas Urquhart. 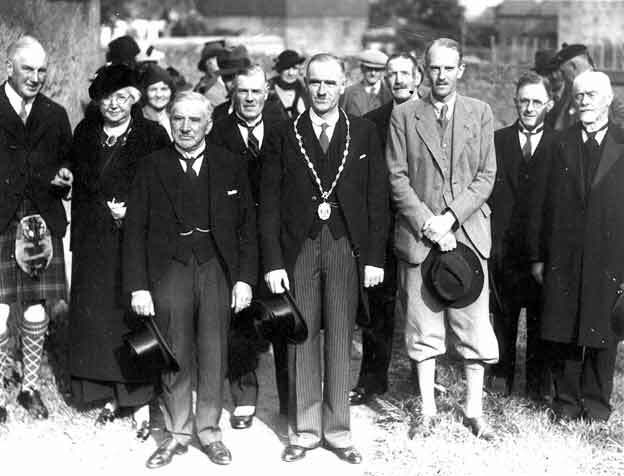 Second left Mrs Vera Piper, with provost D. R. MacKenzie. Front row centre left Dan Ross (Harbour Master), 2nd row centre Mr. Fraser (Banker), 2nd row next right Harry Munro (Policeman), gent with glasses on right Tommy Gaskill (Town Clerk) and extreme right James Reid (former Provost). Name of gentleman on the extreme left in kilt - does anyone know?